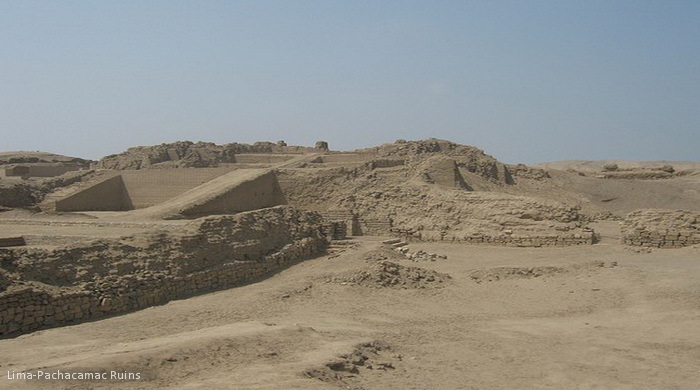 The history of pre-Hispanic Lima is deeply entwined with Pachacamac. Worshipped across the central Andes since before the Inca conquest, the powerful creator god Pacha Kamaq is even revered today, almost 500 years after the Spanish conquest by Catholics in Lima. Today this powerful being has taken shape as the Cristo Morado and has been absorbed into Catholicism, and just as he is today, this ancient figure was also known as the Lord of the Earthquakes. Two thousand years before Christ, the first ceremonial centres were built in the Lurín valley, constructed by people who’s descendants would eventually become, a couple of thousand years later, known as the Lima. The Lima’s society spanned from the valley of Chillón in the north to the valley of Lurín in the south. During this period at least one pyramid was build at this southern centre of power, and the population that lived around it dedicated themselves to worshipping Pacha Kamaq. We now refer to this ancient centre of worship as the Sanctuary of Pachacamac. God of the Earth, this creator god worshipped by ancient Peruvians had the power to make the earth fertile but also to shake it violently with all his strength. Pacha Kamaq was not a god that people loved, he was not a caring nurturing father of the land, he was feared for the destruction he could cause in the form of earthquakes. People pleaded with him not to cause them harm. At 9am pick you up from your hotel and transfer to the Pachacamac Ruins, these ruins are located at 19.26 miles (31 km) of Lima, in the valley of Lurín. Pre-Inca and Inca archaeological construction. Main pre-Inca adoration and ceremonial center of the inhabitants of the valley of Rímac in which the God Pachacámac was venerated. The investigations presume that this place was inhabited since the year 200 up to 1533. From the pre-Inca constructions stand out the "Templo Pintado" and the "Templo Viejo" built with small adobes and pyramids with ramps. After the Inca conquest they built next to them the "Templo del Inti" and an "acllahuasi" (house prepared for the chosen girl). Pachacámac was the God creator of life and of the universe and it was not personified. The state of conservation of this location and its restoration offer a great show of cultural historical interest. Transfer to the hotel .